The Raven ~ Vincent Price was my gateway drug to Edgar Allan Poe. I remember in tenth grade, Mr. Tomasello apparently didn't like teaching English all that much and we had movie days pretty often. Perhaps it had to do with him being in charge of the A/V department or perhaps he just needed naps, but we had movie days a lot. Trust me, no one minded, and sometimes we really dug what was shown. Case in point, Price and Poe. Vincent Price did these terrific, dramatic, and scary readings of Poe stories. The movies were just him, a dark background, and the mad words of Poe. The most dynamic was "The Tell-Tale Heart" and I'm pretty sure there was also "The Cask of Amontillado," and a third lost to the ages, perhaps it was even "The Raven." No matter my memory, I loved it, that I do remember. That said, I've never been much of a fan of the Hammer horrors, at least not the remakes of Universal monsters, but the Poe stuff is so much fun. Seeing The Raven with Roger Corman on the TCM Classic Cruise would be the first time I'd seen it since a long lost Saturday afternoon horror feature decades before. I couldn't wait. Robert Osborne interviewed Roger for a few minutes before the showing of the film. They talked of the difficulties of dealing with Peter Lorre who winged it as an actor and constantly ad-libbed and Boris Karloff who was always on script. As far as the rest of the cast, it included an extraordinarily young Jack Nicholson and Vincent Price, who, to paraphrase Corman, could do anything. The director got everyone to a happy medium. The decision, after a few serious horror adaptations of Poe to do a comedy horror like The Raven. Corman felt he'd played all the horror out of Poe, and went in another direction. Based on the middle tale of Tales of Terror, also comedic, he felt it would work. They also talked about The Terror, which was created and filmed in just a matter of days because Corman still had time with the sets of The Raven. Oh, that Corman ingenuity! The Raven begins and ends with that amazing Vincent Price recital of "The Raven" but the story has bits from the poem, mixed in with a tale rival sorcerers, culminating in a magic duel that, while long, puts similar magician's duels - like in Disney's The Sword in the Stone - to shame. The mad limited special effects are marvelous. 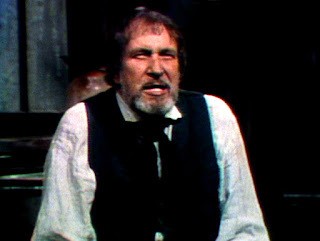 Richard Matheson provided the script under Corman's direction. This was a lot of fun. Now I want to go back and watch all the other Corman/Poe flicks!